Get on board! 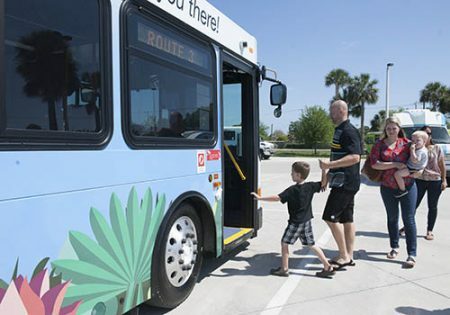 Our GoLine public transit system is designed to get you where you need to go within Indian River County at no cost. Our buses provide service along 15 fixed routes throughout Vero Beach, Sebastian, South County, Fellsmere and Ft. Pierce. Visitors and locals alike take the GoLine to work, school, medical appointments, grocery stores, shopping areas, beaches and a host of other locations throughout the area. Convenient bike racks are available on all GoLine buses. And all are ADA accessible. Passengers must be able to board, disembark and carry their own packages on and off the bus. An adult is required to accompany riders younger than age 12. Although no fare is charged for riding the GoLine, donations are welcomed to help support our public bus system and its continued operation. Download our Route Shout app for live tracking of buses, maps and more at www.GoLineIRT.com. grocery stores and other essential destinations — safely and securely. To become a Community Coach rider, Senior Resource Association’s eligibility specialists will walk you through the process. Determining eligibility is an easy procedure, but required before riding. It is a shared-ride service so passengers should be prepared to make stops along the way to their destination. Personal care attendants who accompany riders can travel at no cost, but they must have the same reservation as the passenger and register with our eligibility specialists. As a demand-response service, Community Coach reservations are required and must be made in advance. Non-emergency medical visits take priority. Availability is on a first-come, first-served basis. 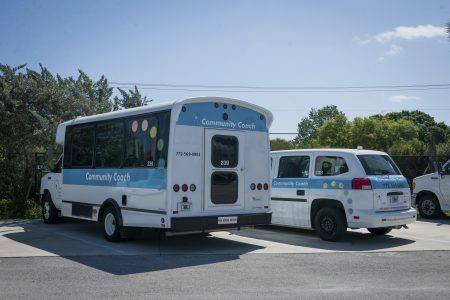 To determine eligibility and reserve your Community Coach ride, call 772.569.0903 Monday – Friday between 7:30AM and 7:00PM, or email us at transit@sramail.org. Indian River Transit operates its programs and services without regard to race, color, and national origin in accordance with Title VI of the Civil Rights Act. Any person who believes she or he has been aggrieved by any unlawful discriminatory practice under Title VI may file a complaint with Indian River County or Senior Resource Association. A complainant may also file a complaint directly with the Federal Transit Administration by filing a complaint with the Office of Civil Rights; Attention: Title VI Program Coordinator, East Building, 5th Floor-TCR, 1200 New Jersey Ave. SE, Washington, DC 20590. Indian River Transit opera sus programas y servicios sin distinción de raza, color y origen nacional de acuerdo con el Título VI de la Ley de Derechos Civiles. Cualquier persona que crea que ha sido perjudicada por alguna práctica discriminatoria ilegal bajo el Título VI puede presentar una queja ante el Condado de Indian River. Para obtener más información sobre el programa de derechos civiles de Indian River Transit y los procedimientos para presentar una queja, llame al 772-569-0903 o visite nuestra oficina administrativa en 4385 43rd Avenue, Vero Beach, FL 32967. Un demandante también puede presentar una queja directamente ante la Administración Federal de Tránsito presentando una queja ante la Oficina de Derechos Civiles; Atención: Coordinador del Programa Título VI, Edificio Este, 5to Piso-TCR, 1200 New Jersey Ave. SE, Washington, DC 20590. Click here to purchase advertising on our buses!